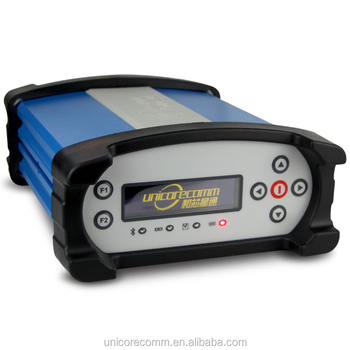 UR380 is tri-system octa-frequency high precision BDS/GPS/GLONASS CORS receiver, based on Unicore’s multi-system multi-frequency high performance SoC -(NebulasTM)1. Together with the built in large memory, a high-capacity rechargeable lithium-ion battery, a variety of communication interfaces such as serial, Ethernet and wireless, as well as a friendly user interface, the complete hardware fits in a rugged, compact unit. UR380 supports multiple standard application interfaces, such as a network interface, RS232, 1PPS, and an external clock. What is more, wireless communications such as WiFi, Bluetooth and 3G are supported, as well as TCP/IP, HTTP, FTP and NTRIP Protocol, available to transmit the raw observation data streaming, real-time differential data streams and observation file of the receiver through network interface. Specially, UR380 supports USB OTG function, which makes it easier for mass storage data transfer and backup. Support BDS/GPS/GLONASS Satellites, and can track and process BDS B1, B2, B3, GPS L1, L2, L5, and GLONASS L1, L2 signals, ensuring more reliable and accurate positioning result. With excellent low elevation angle signal tracking performance and multipath mitigation capability, the receiver can fully meet the data quality requirements by the CORS applications, and ensures a seamless upgrade process for our ustomers. As one of UR380's core processor, by far more than 100,000 pieces of unicore's high performance multi-system multi-frequency SoC chip - Nebulas, has been applied in the market, the SoC chip is characterized by small size, low power consumption and high reliability. UR380 supports web interface, user can configure the boards web interface through Internet Explore . With this, user can manage, upgrade, and restart the receiver remotely, most suitable for the CORS network application. The front panel of UR380 is equipped with a high light OLED screen, which can work in low temperature. Multiple buttons and LED indicators the status of the power supply, satellite tracking, and other information.